This week we have a special treat in store for us all. The great tenor saxophonist Houston Person will be fronting to band for two sets; at 7:30 and then again at 9PM. As a result there will be no jam session. 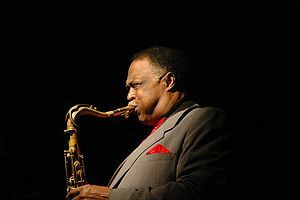 Houston is one of the most respected tenor players in world today, having recorded over 80 albums under his own name and appearing on many more as a sideman. He is most known for his sassy sound in the soul-jazz idiom but is a master of swing and bop and ballad for sure. He started recording and touring in the 60’s and hasn’t slowed down a bit, still traveling all over the globe making great music. This will be Houston’s fifth appearance with us and we can’t wait. Come early for good seats but again, there will two shows so hopefully we can accommodate everyone interested in hearing this master of the music. ← Jamie Kent 413 Summer Party!